Posted on Sat, Feb 25, 2012 : 11:48 a.m. Hundreds of people were attending today's Shipwreck Festival at Washtenaw Community College's Morris Lawrence Building. There are programs about shipwrecks and exotic dive locations as well as exhibits by maritime artists and dive equipment. Divers, historians, and fans of the Great Lakes are finding plenty to do today at the 31st Great Lakes Shipwreck Festival at Washtenaw Community College. The festival has three venues that include presentations on exotic saltwater destinations, educational and technical topics, and Great Lakes shipwrecks. There are also exhibits from local maritime artists, book signings, and plenty of information about diving. Joel Stone, a curator for the Detroit Historical Society, did a presentation this morning about the recovery operation by members of the Detroit Police Department Underwater Recovery Team who retrieved a cannon barrel from the Detroit River last October. It was the second pre-Revolutionary War artillery piece found in the same area. 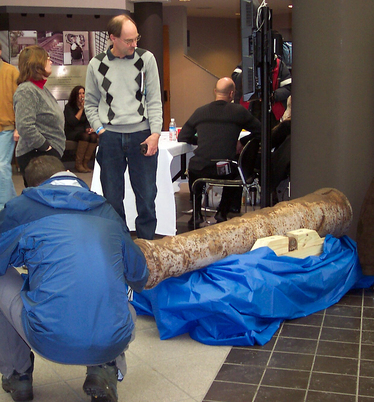 Visitors at the Shipwreck Festival at Washtenaw Community College inspect a cannon that is similar to one recovered by members of the Detroit Police Department Underwater Recovery Team last October in the Detroit River. The lore of Great Lakes shipwrecks attracted hundreds of people to Ross Richardson's lecture this morning about the shipwrecks of Sleeping Bear Point, located at the northern end of Lake Michigan's Manitou Passage. Richardson, who spent nearly a decade on the board of directors of the Michigan Shipwreck Research Associates, talked about three recently located uncharted wreck sites. "The most recent wreckage washed up in October of 2010," said Richardson, who showed the audience underwater photos he took of the wreckage. "I was searching offshore using sonar and stopped to snorkel and have a look around. The water was clear for good visibility that day." Other presentations today include Jim and Pat Stayer, who have spent 37 years diving in the Great Lakes and around the world. They spoke about their experience at San Benedicto, a volcanic island 250 miles south of the tip of Mexico's Baja Peninsula, where they encountered hammerhead, tiger and Galapagos sharks as well as manta rays and several species of whales. The Shipwreck Festival is presented by the Ford Seahorse Scuba Diving Club, in conjunction with the Detroit Historical Society's Dossin Maritime Group and the Dossin Great Lakes Museum. Programs run till 5 p.m. today at the Morris Lawrence Building, 4800 E. Huron River Drive, in Ann Arbor Township. Tickets are $25 at the door. Sun, Feb 26, 2012 : 2:34 p.m.
We went to the shipwreck museum up near the Soo in the UP. That is an awesome museum. I wish I could get on an email list of things going on at WCC. Wow. This is terrific. Second thing I've missed so far. O well. Thanks for the heads up.